Did you know that the companies that wait to adopt AI to transform business may never catch up with early adopters? Read this whitepaper to learn how to transform your business with AI powered business intelligence. Gartner Survey Shows 42 Percent of CEOs Have Begun Digital Business Transformation. While the idea of shifting toward digital business was speculative for most CEOs a few years ago, it has become a reality for many in 2017. HOW TO TRANSFORM YOUR BUSINESS DIGITALLY WITH ARTIFICIAL INTELLIGENCE & BLOCKCHAIN ? Machine learning and Blockchain technologies can help in implementing a system that reduces the human efforts in compiling and interpreting various aspects of supply chain and logistics management. This can simplify every process of a supply chain by making it more transaprent and traceable and to generate higher profit margins. AI in RPA is a great choice for businesses to streamline processes, improve performance and reduce costs considerably. With the right guidance, any high-volume, low value process oriented task can be automated at ease. Read more to learn how to get started. Transparency and increased traceability are becoming a standard in business sectors such as supply chain, retail, mining, agriculture pharmaceutical, etc. Today's customers demand to know a product's origin, its route throughout the entire transformation and distribution chain. Blockchain technology facilitates your business to have enhanced transparency and traceability. Using AI and Blockchain technologies, businesses can create a customer experience that is far more well-rounded and personal. By enabling crypto customer loyalty programs, crypto incentives programs, in-store AI sales concierges, etc, a business can connect better to their customer to do more sales. With the advent of Blockchain technology, businesses now can benefit with the immutability and accountability enabled by the decentralized ledger technology. From preventing double selling in the real estate industry to automating business transactions, Blockchain can transform your business to be more efficient and productive. The landscape of the business world is changing. Businesses today need to embrace the cutting edge technologies such as Artificial Intelligence and Blockchain to stay competitive and adapt to the technological advancements influencing almost all market sectors. With Accubits AI Powered Business Intelligence Suite, we help your business to streamline the operations and processes to cope with the changing needs of your target markets. Digital transformation enabled by Accubits helps your organization to perform better by either increasing productivity and/or reducing operating expenditures. It is not a stretch to say that the adoption of AI in business management helps in every aspect of a business. Using an AI, organizations can considerably reduce the number of human resources required to run the organization and provide better user experience to their customers. Integrating Blockchain in Business can impress their customers with transparency and improve customer loyalty. By eliminating intermediaries, businesses can deal directly with their customers and build a lasting relationship and attract new customers. Accubits Business Intelligence Transformation Suite helps your organization to quickly implement the digital transformation using cutting edge technologies. Artificial intelligence, blockchain, big data, cloud computing, virtual reality technologies, etc to can enable the competitive advantage your business needs to be future proof. Improve consumer engagements, optimize business processes with automation, optimize your customer retention and grow 10X faster with Accubits AI-Powered Business Intelligence Solutions. ABITS can accelerate your business efficiency by identifying the digital transformation opportunities to enhance productivity and to optimize operations. Identify the digital transformation strategies relevant to the business and guide through the process involving prototyping, deployment, and implementation. Design and iterate the existing business model to incorporate cutting edge technologies to facilitate stronger competitive capabilities, operational efficiency, and productivity. Transform your business to be future proof by migrating from obsolete technologies to cutting edge technologies. Set your business free from any technological hindrances to perform better. ABITS can help your business to deliver an exceptional experience to your customers. Reap higher profits by increased customer retention, customer loyalty, customer referrals, etc. Should your company use the blockchain technology? How your company can adopt blockchain technology to add more value to the business? 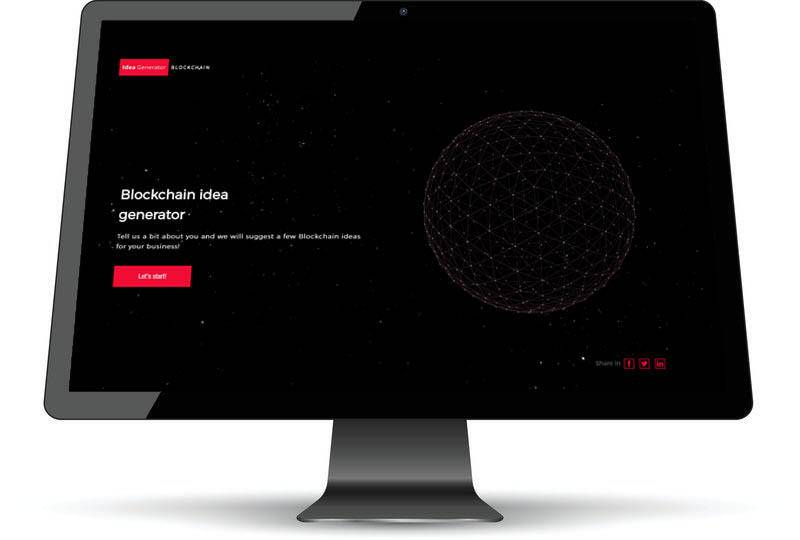 Try our blockchain idea generator tool to figure out how your business can adopt blockchain technology. Tell us a bit about you and we will suggest a few Blockchain ideas for your business! Reinvent your business with Accubits Business Intelligence Transformation Suite. Re-imagine your customer engagements, improve business processes with automation, optimize your customer retention and grow 10X faster with AI-assisted business intelligence. From smarter financial transactions to more secure business processes, Blockchain technology is hailed to transform the business sector for good. Learn more about the related development services included in Accubits AI-assisted business intelligence solutions. Enhance your business operations with the tangible benefits and competitive edge offered by blockchain technology. Success stories of how Accubits Business Intelligence Transformation Suite helped organizations from around the world to transform their business operations to be more efficient and profitable. Read more about how Artificial Intelligence is transforming the business in various industries. The landscape of the business world changes every day. With every new business offering better products and solutions, the competition is getting tougher and only the fittest and smartest can survive.By the time a late adopter completes system development, integration, interaction learning, and AI application governance, early adopters will have taken up a considerable market share and will be operating at substantially lower costs with enhanced performance.